Our most popular basket! 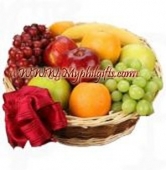 Filled with the finest fresh fruits and hard candies, this basket makes the perfect gift for any occasion. Fruits may include apples, pears, oranges, bananas, and grapes. Your purchase includes a complimentary personal Greeting Card.